Our handmade Yoshihiro Kasumi knives are crafted by our master artisans with the utmost care to create high quality knives that offer exceptional performance with exceptional value. Kasumi translates as mist and refers to the beautiful mist like patterns on the blade that are formed when White Steel 2 (HRC 62 to 63) is forged with iron. Our Yoshihiro Kasumi knives are complimented with a traditional Japanese handcrafted Magnolia wood (D-Shaped) handles affixed with a Water Buffalo horn bolster. A protective wooden sheath called a Saya encases each knife and adds to its appearance when not in use. 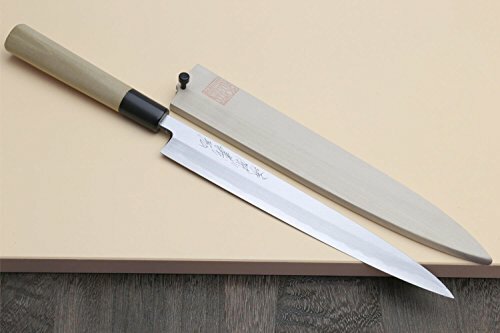 The Yanagi is a long slicing knife designed to cut thin slices of fish for sushi and sashimi. The beauty of its elegant thin blade is in its ability to slice through ingredients in long uninterrupted strokes, preserving their integrity and freshness. The Yanagi is one of the most essential of traditional Japanese knives and is a powerful component in the repertoire of many chefs. Even the simplest of tasks are elevated with a handcrafted knife that is as beautiful as it is functional. Available in 9.5 Inch(240mm) to 13 Inch(330mm), with a limited lifetime warranty. Although traditional Japanese carbon steel knives are not stainless, with proper care they can provide years of enjoyment. Keeping dry in between usage, and applying Tsubaki Oil(as included) before storage will keep your knife in tip top shape. Japanese knives should always be sharpened and honed on premium quality Japanese water stones. Forged from Japanese White High Carbon Steel #2 with HRC 62-63. Will become extremely sharp with whetstone sharpening. 9.5 inch (240mm) single edged blade with a traditional grind. Completely flat ground on front (SHINOGI), concave ground (URASUKI) with flat rim (URAOSHI) on the back. Will glide through any type of fish with no pressure. Just start the cut and pull the knife back. Simple and elegant design with a handcrafted Magnolia wood Japanese D-shaped handle and a water buffalo horn bolster (COLOR VARIES) for a light and well balanced construction. Excellent for entry level chefs. Magnolia wood knife sheath, knife oil, and rust eraser included. Hand wash only and sharpen on quality whetstones. Comes ready to use out of the box. 100% handcrafted in Japan. Not mass produced.